It's Sunday and time for the Koh Samui, Thailand weekly weather update; 19th June – 25th June, 2017. 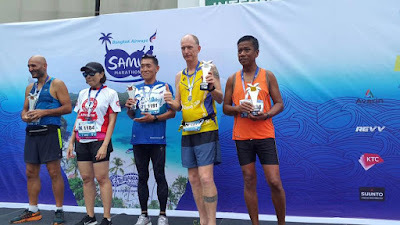 It's already 4pm and I was too tired and sleepy after a very early wake up call and participation in the Bangkok Air Koh Samui half marathon today, which had a 5am start. I came second in my age group in a not so great time of one hour and 57 minutes and was 12th all over out of some 170 participants. Last week saw some fairly wet days, most days had some rain in some sort, from small showers to some tropical thunderstorms. Max temperatures ranged around 32 to 34C. Not the best of week for weather but come a lot worse as well. There was still a few sunny breaks throughout the week. The forecast for next week is looking ok-ish. Plenty of cloud cover is predicted for the next seven days with an occasional shower and possibly some wind. Koh Samui, Thailand weekly weather update; 19th June – 25th June, 2017; Bangkok Air Koh Samui half marathon, top finishers with me coming in at second place in my age group, earlier today. A Thai at first place, Dutch # 3, Japan #3, Danish #4 (not in the picture) A very international winners stage indeed. Please do 'like' my Koh Samui blog Facebook page and enjoy the beaches around the island or in front of your hotel or resort and get some well deserved rest and a break. If you're done resting or need something else to do, there's plenty of things on offer on and around Koh Samui, you can go snorkeling or diving or take a dive course. You can also enjoy some of the trips I recommend, like a half day gourmet lunch and snorkeling trip at the Southern part of Koh Samui or a photography trip where you get to see the most photo genetic spots on the island or go for a drinks tasting tour if you like a tipple or two. It's Sunday and time for the Koh Samui, Thailand weekly weather update; 12th June – 18th June, 2017. It's almost noon and it's partially cloudy and hot around Koh Samui, 32C already! This morning I ran my first trail run in Thailand in Kamala on Phuket, with a very steep hill which lasted almost 2.5km. The total distance of the race was 10.3km and I finished 9th all over out of 400 participants and 3rd in my age group of 40+. A very unexpected but nice result. Later this afternoon, or rather soon, I will my June 2017 PADI IDC candidates for their last part of their PADI IE at Kata beach to see if they made it into the PADI Instructor ranks. A very nice week indeed! Next week looks like it's going to be very similar weather around Koh Samui, with mostly partially clouded skies and a bit of a breeze. 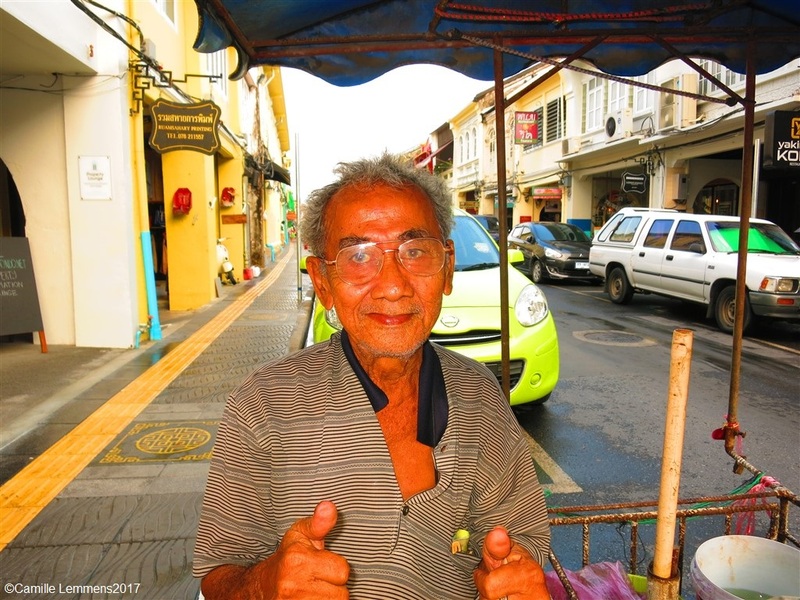 Enjoy and I see you back next week on Koh Samui and the Samui marathon come next week. It looks like I will be running the half marathon distance. 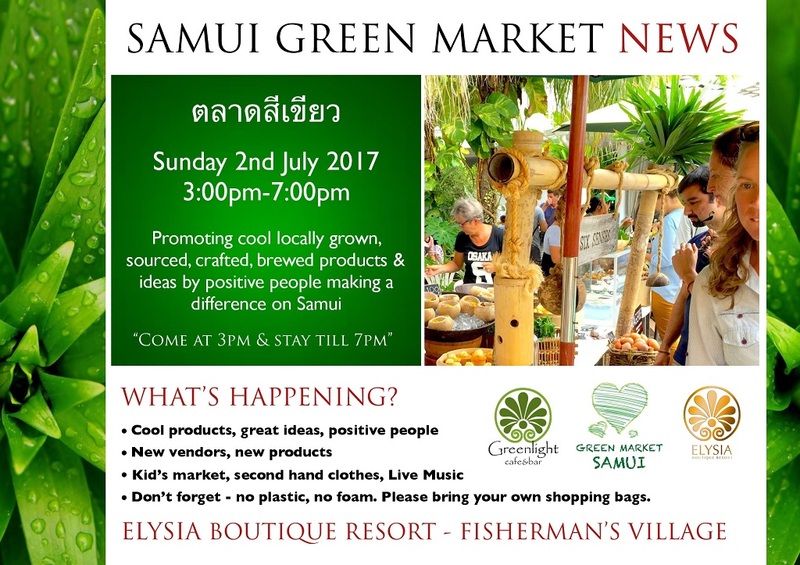 The next Samui Green Market will be on 2nd July at Elysia Boutique Resort in Fisherman's Village between 3 and 7pm. As always it's all about promoting locally grown, sourced, crafted and brewed products. I love the various and different breads on sale, but there is a lot more on offer than just bread and a lot of the products and food on offer are organic. Many different products, a lot of them food related will be on sale. French cheeses, products from Sweet Sisters and a few hotels have food related options for sale. Also not to forget is the Elysia itself, that usually sells some lovely food to eat during the Green Market. There is always some live music available and in general there's a nice atmosphere and some options for children to play around as well. Hope you can find the time and interest to join come Sunday 2nd July and support local produce. Looking forward seeing you at the Elysia Boutique Resort ! Time for the Koh Samui, Thailand weekly weather update; 5th June – 11th June, 2017 and have a look at today's weather, last weeks weather and a a forecast for next weeks weather. Next week is looking, partially cloudy skies with lots of sunshine and maybe mid week a very isolated tropical shower. A very nice June week indeed is waiting for you if you are already on Koh Samui or are planning to visit next week. Enjoy it and dig in to the all the options available to you to have a good time on our island, day trips, attractions and good food is all at your command. It's Sunday morning and time for the Koh Samui, Thailand weekly weather update; 29th May – 4th June, 2017. Koh Samui, Thailand weekly weather update; 29th May – 4th June, 2017; The beach in front of Zazen Boutique Resort, nice lovely and fairly quiet this time of the year. Just before it starts to get busy again! Last week saw nice and sunny blue skies in the morning, especially later during the week but the blue skies were often replaced by cloudy skies and a bit of rain. At times we saw very hard rain with minor floods. Max temperatures ranged from 32 to 35C, so hot and humid. The forecast predicts more strong wind, maxing out on Tuesday and some thunderstorms combined with some tropical showers. As of Tuesday it should be fairly cloudy, so not too sure about the amount of sunshine that can be expected during next week. Still a good time to enjoy some of the tours that are on offer as explained below! 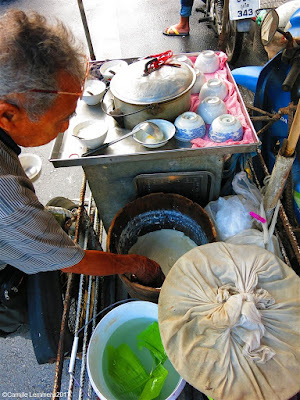 It's been a while since I posted an update in my Food on Wheels series but now it's time for this lovely blog post about Food on Wheels; Tofu with herbs in Phuket Old Town. Whilst walking Thalang road the other day, this older man was passing by, selling tofu pudding with ginger syrup to local people sitting in their houses and shops. Initially I had no idea what this was and what to expect and as with so many other Thai street food, I didn't think it would be very healthy and passed. 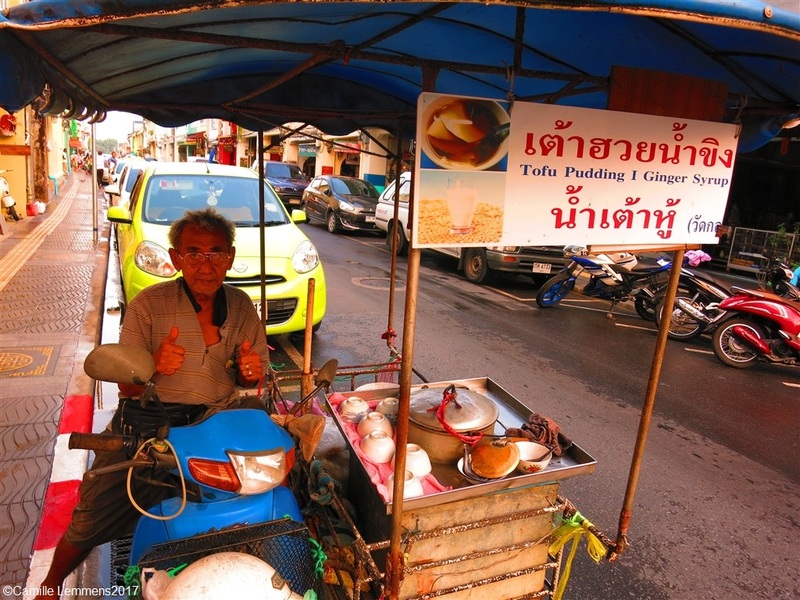 A few moments later my wife joined me and she explained what it was and I was more than willing to try this tofu pudding with ginger syrup and it was delicious. Not sweet at all but rather tasty. The tofu is literally sliced off a big pile of tofu with a wooden tool and the ginger syrup is added in the bowl or plastic bag if you want to take it home. It needs to be eaten fairly soon after purchasing it since it doesn't stay well overnight, as we found out. In case you encounter this very friendly person with his tofu pudding, don't hesitate to try it but go for it, you won't be disappointed. It also won't break the bank, so at the odd chance you don't like it, you will survive! 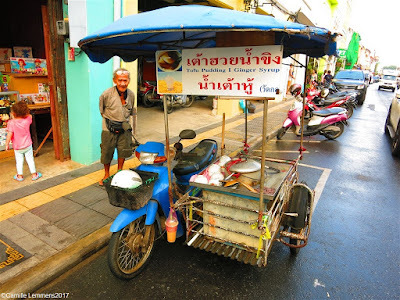 Food on Wheels; Tofu with herbs in Phuket Old Town; Still going strong after all these years, but what do you expect with such healthy food! It seems to get harder and harder to get by some original Food on Wheels stories, but I'm glad that I can post this one, a real gem from (almost) times gone by. It seems like it's becoming a yearly tradition, a Box jelly fish awareness and prevention presentation 2017 at Zazen Boutique Resort in Bophud/Maenam. For the third year running, the Zazen Boutique Resort had their staff trained and updated about box jelly fish threats, awareness and how to handle during box jelly fish incidents. It was good to see familiar as well as new faces during the presentation. It also shows the dedication and importance of Zazen's owners and management, to stay on top of events and their intent to look after the best interest and well being of their guests. Hopefully the information and practice provided will never be needed on or near Zazen's premises, but at least the staff had training and is prepared just in case. Box jelly fish awareness and prevention presentation 2017 at Zazen Boutique Resort; CPR training was part of the presentation and this year there was a lot more enthusiasm from the staff to actually practice. Thanks to Zazen Boutique Resort for the invite and the dedication they show. If you're interested in getting to know more about awareness and prevention of box jelly fish, please contact me for further details. It's a combined Goodbye to May and welcome to June 2017, so let's first look at what May brought us. June is typically a fairly nice month on Koh Samui with plenty of sunshine but also with possibly some rain, as can be expected during this small monsoon period for our island. The West coast is typically more affected by this monsoon period. It's a good time to be on Koh Samui and enjoy the attractions the island has to offer; beaches, sun and some areas well worth checking out during a sight seeing trip. Last month I spent two weeks on Phuket and this month I will be off to Phuket again, come Monday. It almost feels as if the rainy season on Phuket hasn't stopped this year! Plenty of rain and strong winds seemingly all year through with more in the pipeline for both coasts after this weekend.